The worst thing you can do for your website is neglect it. 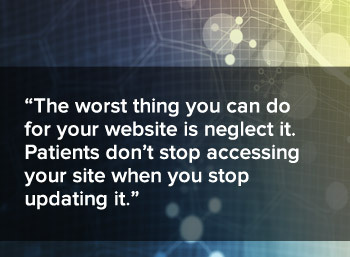 Patients don’t stop accessing your site when you stop updating it, and this can be detrimental to the image of your practice (especially for new patients with whom you are making a first impression). Information related to office hours, address, phone numbers, and staff information needs to be given special attention. Updates may also include adjusting content to be seasonally-specific, or related information on changes in insurance or billing legislation. Timely and useful information will keep patients coming back to your website. Often the first stage of creating a website is just to get an official digital presence live. While having an official location for patients to find the most accurate information about your practice is certainly a good start, there are other valuable details that you may be missing out on – such as patient education, an online payment and scheduling system, or the completion of new patient forms. Some processes which may even save your practice money. For more details on helpful tools – see Dr. McElveen’s recommendations in “3 Tech Tools to Grow Your Medical Practice”. Employees who answer the phone within your practice may receive questions about your website. For this reason, they will need to become familiar with the site content and functionality in order to best help your patients. If you are utilizing your website for sharing patient education materials, be sure that everyone in your practice knows what’s available on the website so it can be utilized during the consultation, exam, or part of their follow up. Once you have built a website worth sharing, you should consider all of the ways you can begin bringing more customers to it. This includes adding the URL to all of your print materials and linking to popular content from your email communications. By tracking which web pages receive the greatest traffic, you can learn which types of content your patients are most interested in. Remember that looking like you have a successful practice is just as important as having a successful practice—and a professional website is your most public branding opportunity.